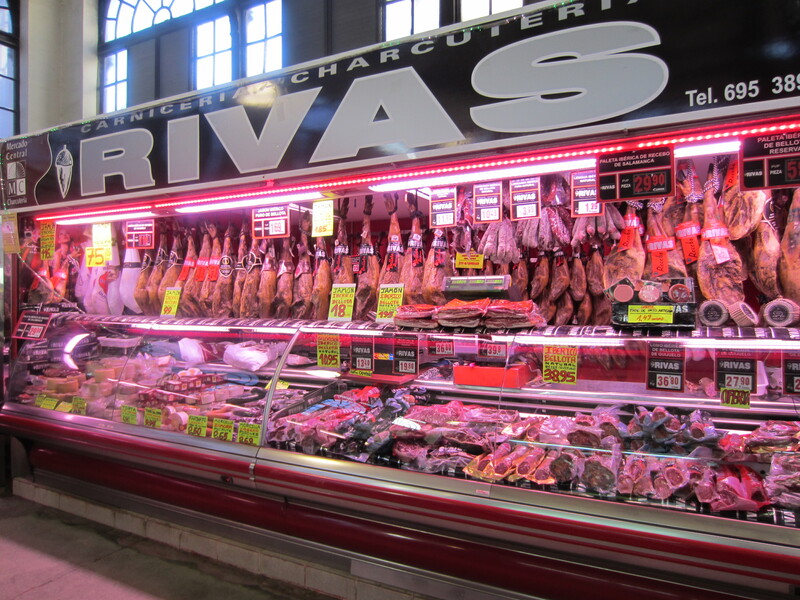 Taking a walk through the small yet lively market in Salamanca is the perfect way to warm up your taste buds for an afternoon of tapa indulgence. This University town has tapas to suit anybody’s taste. 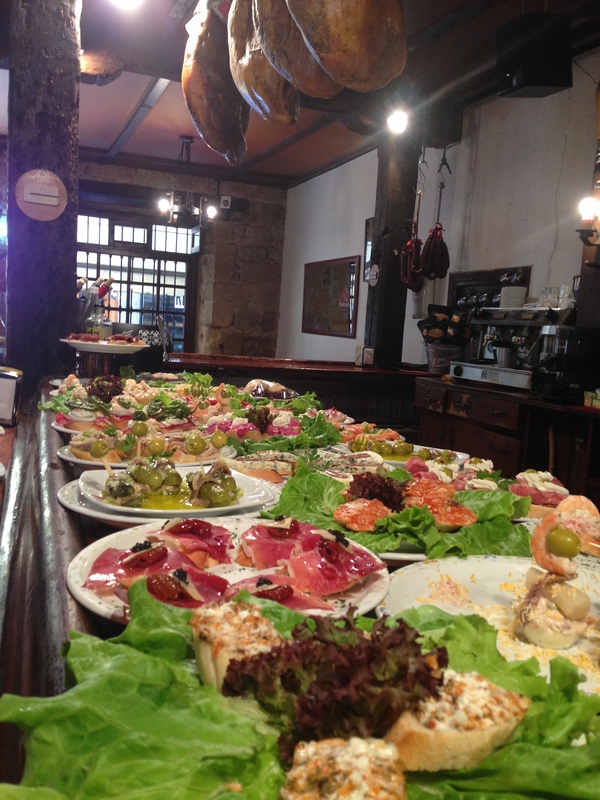 For a plate of the some of the best ham, chorizo and cheese you should look for Las Caballerizas. It is a student cafeteria in the old stables of Salamanca. Cheap, traditional and delicious. 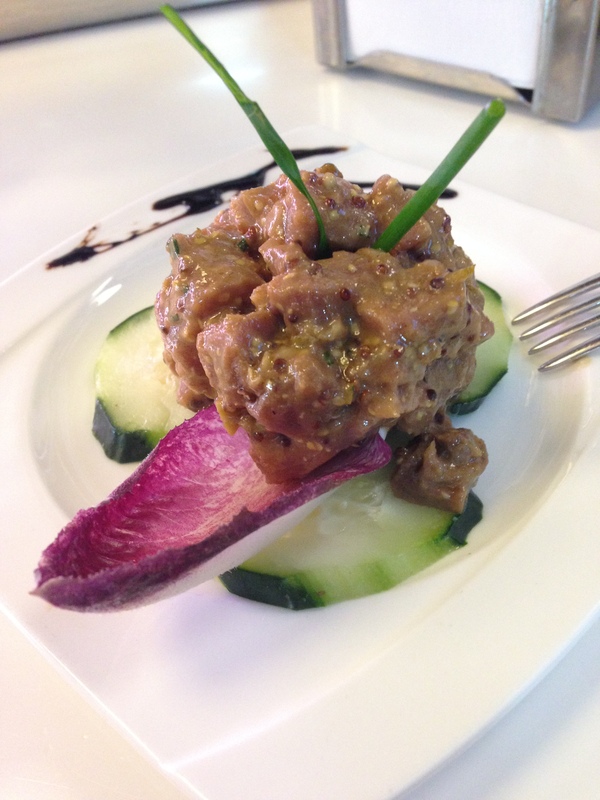 We always like to make a stop in Casa Paca right of the Plaza Mayor. The pisto (vegetable stew) with quails egg is one of my favorites. My daughter loves the meatballs and the “broken eggs” with ham and potatoes. The bar is the place to be where you can easily choose from the display of tapas but a table can be nice as well to kick back and observe the local flavor. 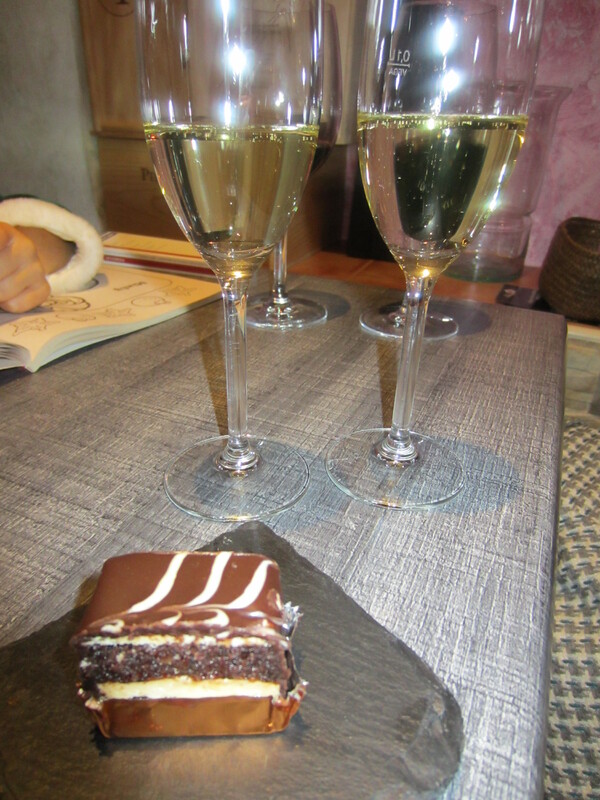 Sometimes tapas with a modern edge can be fun as well. Last year we stumbled into a place off the Rua Mayor. 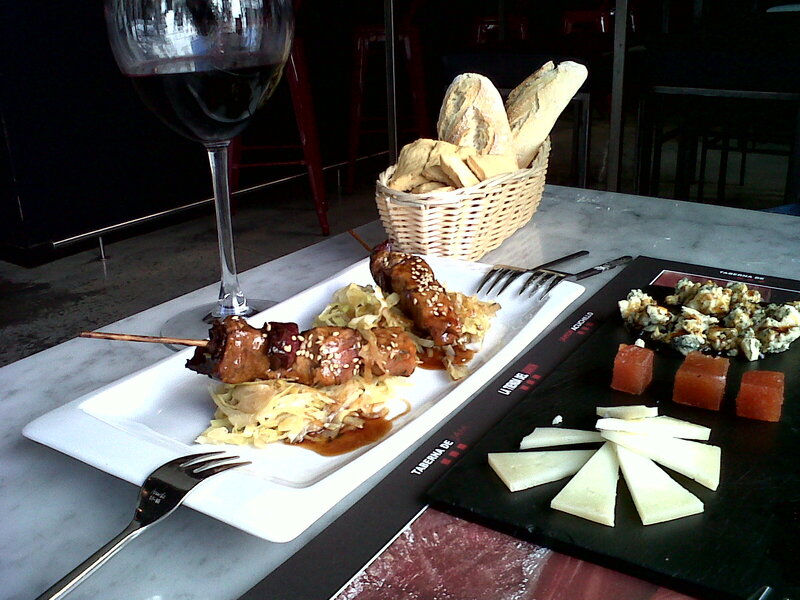 It is called Tapas 2.0, Gastrotasca. 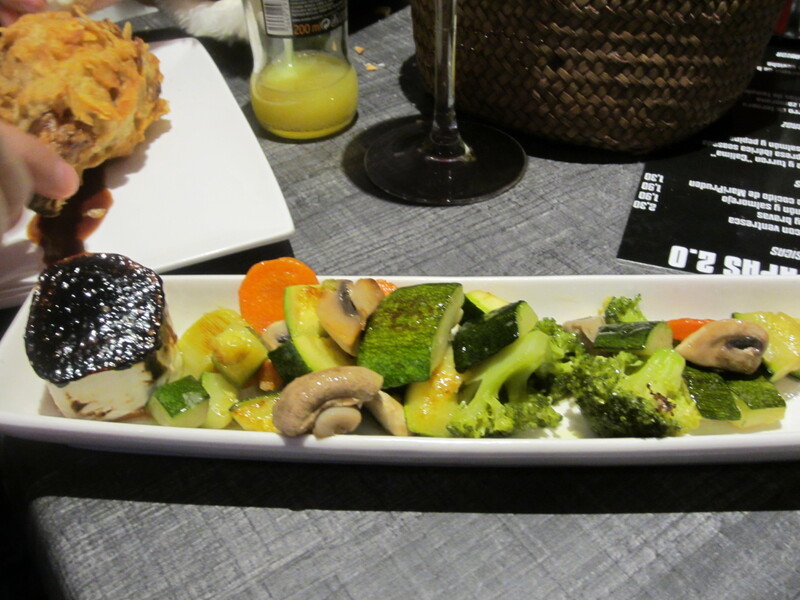 We were needing something green in our lives and were pleasantly surprised by the caramelized goat cheese with veggies. After that there was no stopping us. 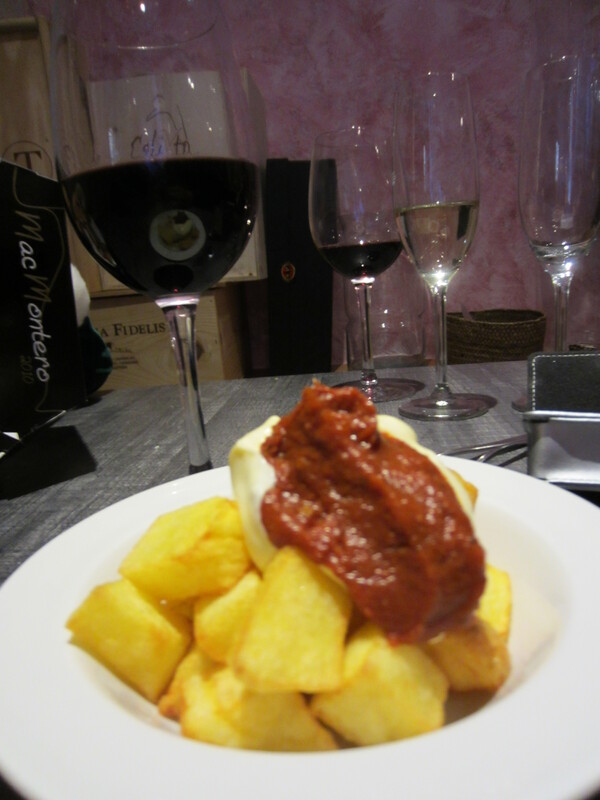 The crispy chicken leg was delicious and the patatas bravas rank among my favorites. Slightly spicy with a hint of garlic. 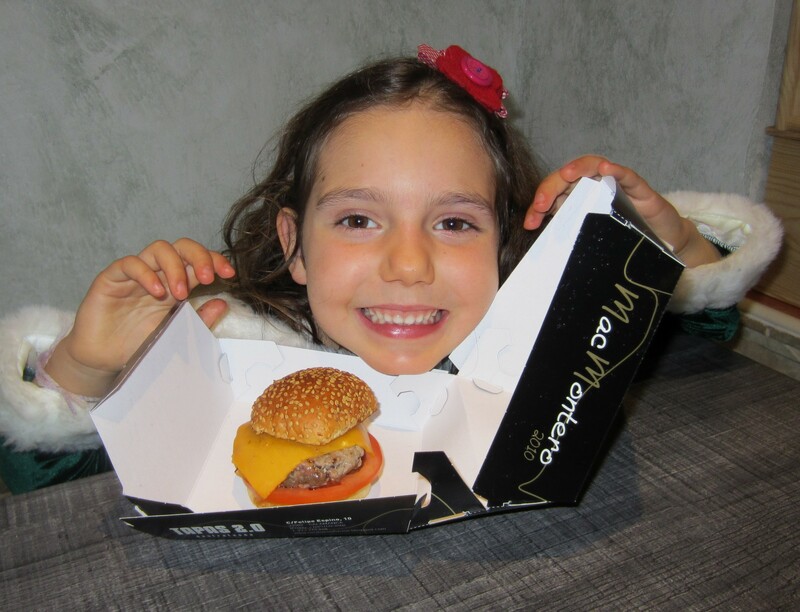 As my daughter dove happily into the Mac Montero burger we were offered two glasses of Cava and a piece of chocolate cake to celebrate their anniversary. Heaven for us! Salamanca never disappoints. The beauty of the city mixed with the atmosphere and outstanding food welcomes me with every visit. 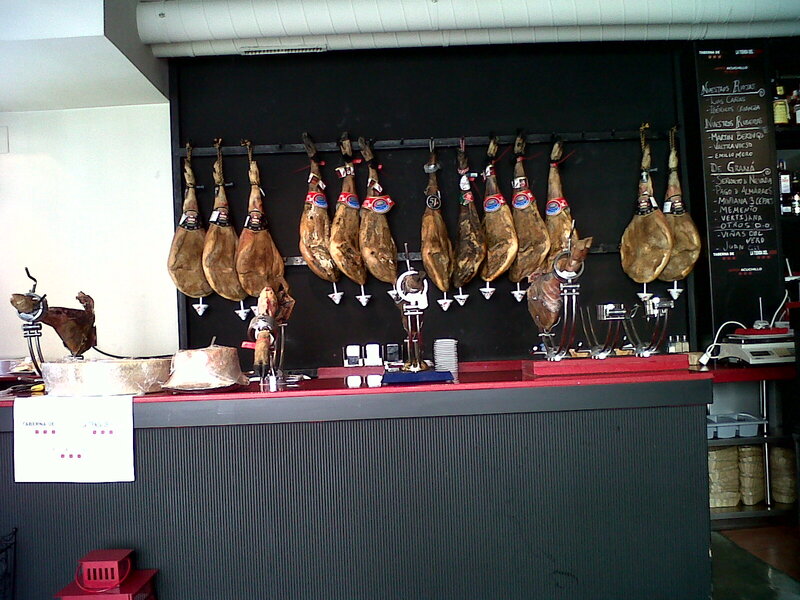 The only thing more important in Spain than futbol (soccer) is ham. Jamòn, be it Ibèrico, Serrano, Pata Negra, de Trevèlez, let ham live! I have to be honest and admit that I pretty much avoid the average tapas bars in Granada that slap down a piece of ham and bread for a tapa. I don´t like bad ham. I´d rather drink a cheap wine than eat cheap ham. I prefer jamòn ibèrico but I have also learned to appreciate cured ham from the lower Sierra Nevada Mountain range here in Granada. Jamòn de Trevèlez. However, if given the choice, I prefer cheese. Always have, always will. All cheese. Soft, sweet, stinky, hard. I love it all. When “Jam” first opened in Granada I would walk by the large windows and peer in while inhaling the deep smell of cured ham. The name of the tapas bar made me laugh. Ham, but in Spanish with a J. Finally, one day we decided to give it a try. I’m yet to be dissapointed by their tapas and cheese platters. They have an amazing wheel of Stilton cheese that they fill with Pedro Ximènez, a dark and sweet sherry. It is out of this world and the reason to order a cheese platter. 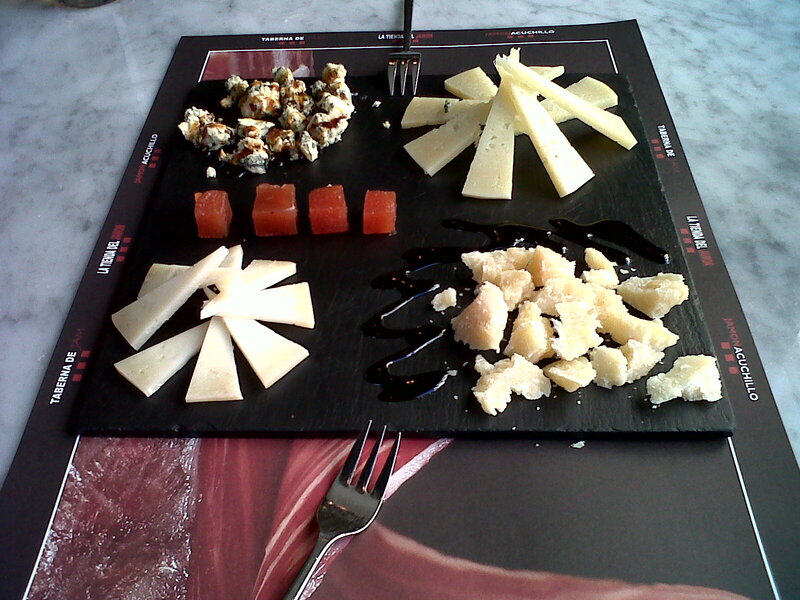 It is accompanied by a nice selection of cured manchego´s and reggiano. The tapas are also delicious. On one afternoon we enjoyed a great marinated dogfish with red cabbage and teriyaki chicken with a sweet and sour cabbage salad. Save the best for last they say, no? The bonus dessert at “Jam” is an explosion of flavor in your mouth. 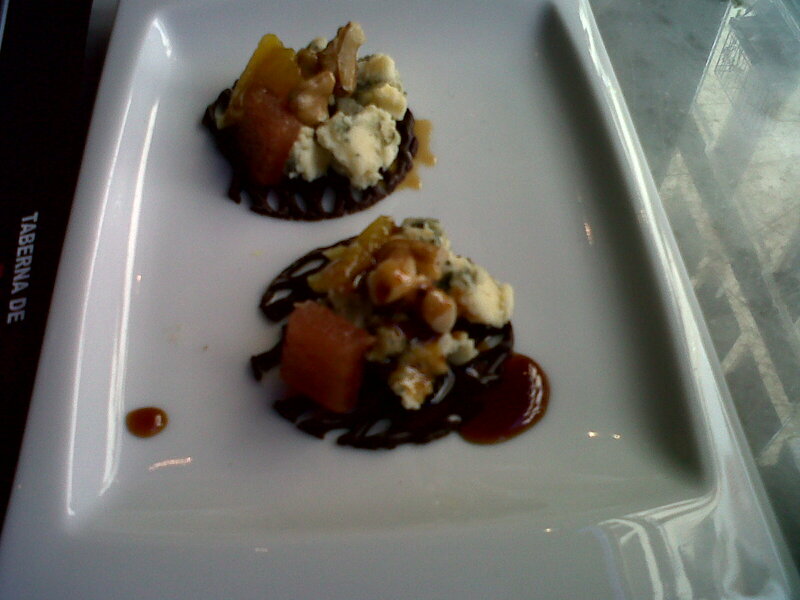 Cured ham covered with dark chocolate and topped with a bit of stilton, a walnut, and a bit of quince paste. It doesn’t get much better than this!! 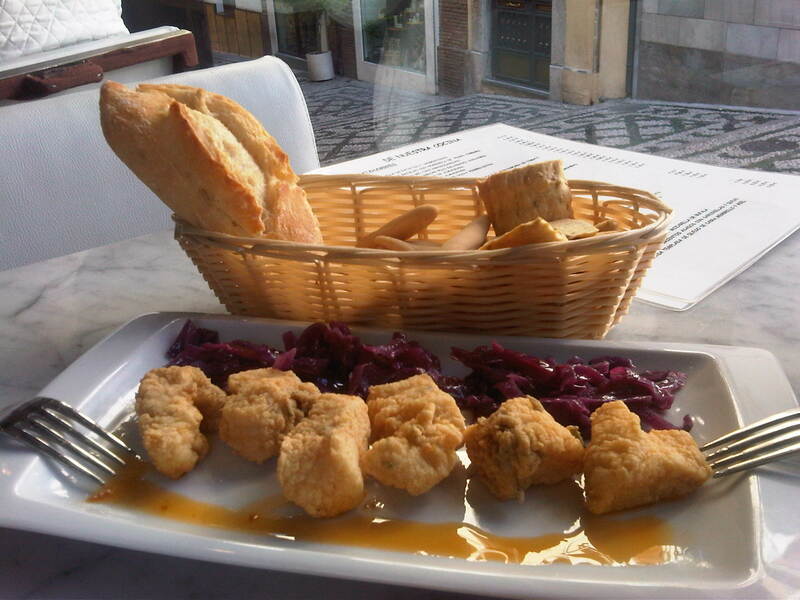 Tapas are a way of life in Spain. Small, simple dishes of food that vary depending on the region and the restaurant. 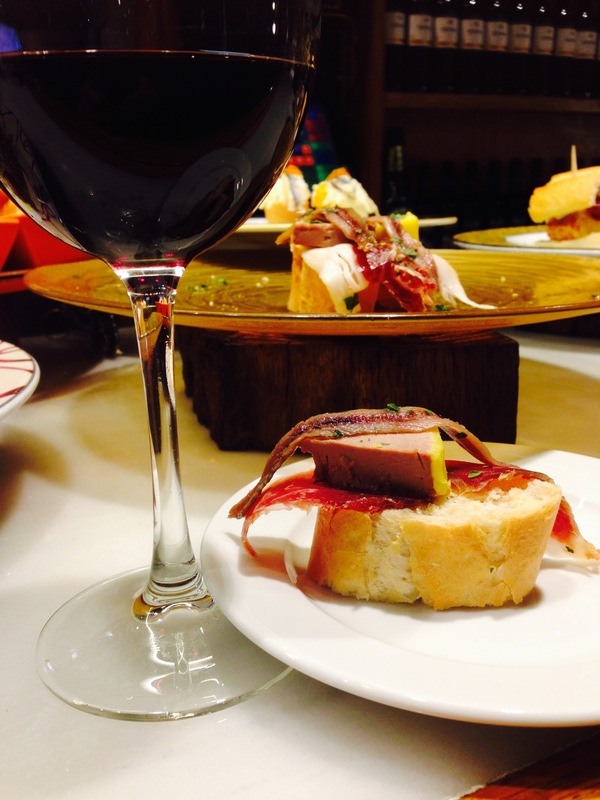 The word tapa simply means “cover” or “lid” since originally a slice of cheese or ham was placed over a glass of wine. Whether this was done either to keep the flies out or simply because someone decided it is preferable to have some sustenance along with your beverage of choice, the outcome shaped an important part of this culture. This is my first of many posts dedicated to the “tapa”. Where I live in Granada tapas are free. Not just in the city, but in the entire province (county). There are many places throughout the country where you will be given a bite of something when you order a drink, be it olives or a small dish of paella. 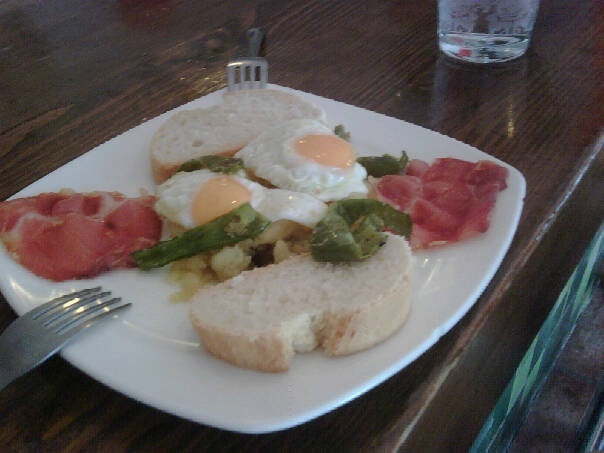 But in Granada, the tapa enters into a whole different dimension. During “tapa time” which happens between 1 p.m and 3:30p.m. and then again from 8p.m. 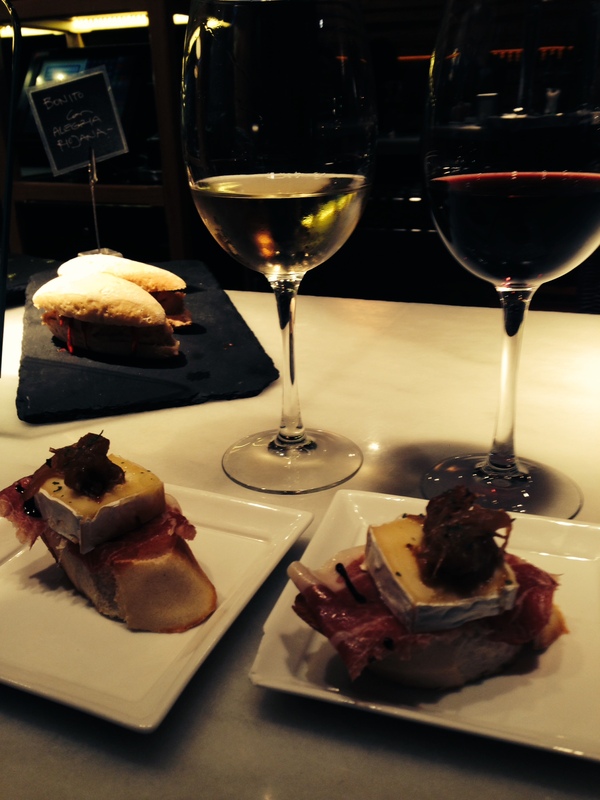 to 11 p.m. more or less, you are given a free tapa with each drink you order. In many bars you are simply given a different tapa with each drink where in others you are given a list of tapas to choose from. The assortment varies from bar to bar and can include anything from fried fish, meatballs, cured ham or a Spanish omelet to fried eggs with potatoes, snails in a spicy sauce or a small baguette with pork tenderloin and tomato. The list is endless. Ham, eggs, potatoes and peppers! A light Tapa! !